I mentioned the other week that I’d been invited to the SFA Grassroots Awards dinner at Hampden. Strange as it may seem the point of the evening was not actually to give me a free feed. In fact a number of our game’s unsung heroes were honoured. So I’m indebted to Steven at event sponsor's McDonald’s for providing some info on each of the winners. Everyone of them deserves our applause and our gratitude. This season sees Raymond Kelly celebrate his twenty fifth year as secretary to the Aberdeen Juvenile. 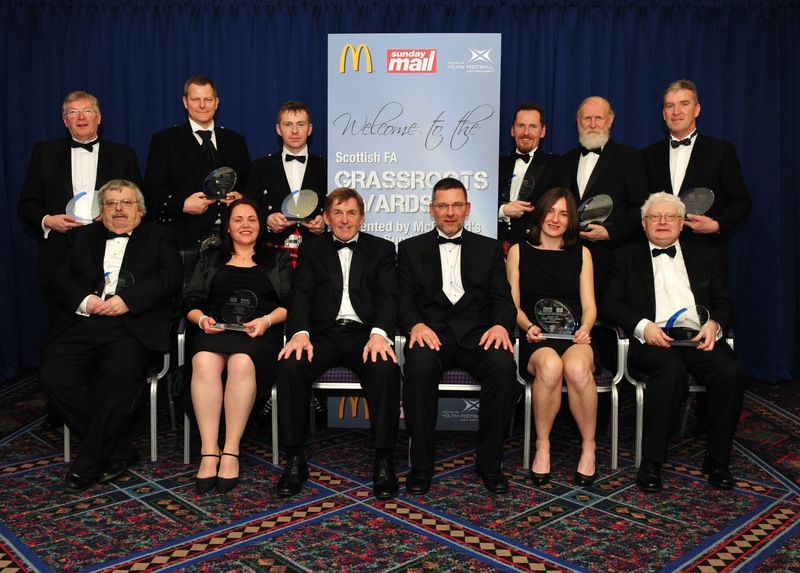 He has overseen the growth of the Aberdeen and District Juvenile FA to well over 240 teams from the ages of 9s to 19s. Raymond is currently in his final year of his 3 year stint as President of the SYFA. Raymond is also an active member of the SFA Regional Committee, has been treasurer of the Aberdeen Sports Council, and has received the SALSC Award for services to local sport. His job as a Director of Tax for the Wood Group takes him all over the world. Robert Bartlett is the founder, chairman and also the head coach at Cuminestown Youth Active Football Club. Cuminestown is a small village in the heart of Aberdeenshire with a population of around 500 and just one primary school. From one afternoon taking a couple of local children for a ‘kick a boot’ in the park, Robert has now created and developed an excellent club that boasts over 70 children. Scottish FA level four coach Robert along with a very supportive and hard working committee now have three teams (8s/10s/12s) that play in the North Region Youth Football Association fixtures during the summer season and have additional teams being prepared for girls football and Under 8s ready for next season. Cuminestown YAFC is very much a family orientated club that continues to grow and Robert has established himself as a local hero in the area and is a fantastic role model to the club’s coaches and all the children involved. The efforts of Robert and his team have been recognised by both the Scottish FA and presented the club with the Quality Mark Standard Award, with the club now pushing for the next level. For over 30 years Bob has been the fixtures secretary of Edinburgh Schools Football. Throughout that time he has also ran numerous teams at Forrester High School and has been heavily involved in the Edinburgh select side. Quite literally generations of school children in Edinburgh owe their start to Bob. His phenomenal amount of service to Forrester & Edinburgh Schools for the past 38 yrs. His teams are always well disciplined and he is held in the highest esteem by all schools football. Due to retire in this school year, this award would be fitting tribute for Bob’s unfaltering service to schools football over the past four decades. For over a decade Laura has relentlessly promoted women’s football in Scotland whilst also finding time to lead GCFC into the respected echelons of European football. Although her playing career may be over she will continue to devote much time and energy into further enhancing the profile of GCFC as well as ensuring that women’s club football in Scotland becomes even more successful. Laura is a more than worthy winner. > In one of the spikier acceptance speeches of the evening Laura spoke passionately about the ongoing struggle to raise the profile of the women’s game. She may be retiring from playing but Laura will still be an active and vocal champion of the sport. Stuart’s enthusiasm and dedication to his teams is fantastic. He has been instrumental in getting the Quality Mark standard for his club and every year runs a football festival for over 400 boys and girls. Stuart got involved in Renfrew Victoria as a favour, in 1990, to the founder member of the club local man John Burns. Since that time the club has grown from one team to 13 teams covering ages from under 7-17. Over the years Stuart has made it a priority to put something back into his community and as such decided to host an annual tournament which gives children enjoyment through football whilst also raising money for charity. Cowie United FC was born in 2004 out of a desire for young people in Cowie to simply play football regardless of their ability. From 15 kids it has now grown to a club of over 140. Cowie United’s approach is different because they encourage children of all abilities and from all backgrounds. Cowie United have been working relentlessly over the past 3 years to raise £180,000 needed to provide a new pitch. This project is about ‘more than just a football pitch’– all the community will benefit from improved green space, and Cowie United as a community organisation does ‘more than just football’ e.g. Summer festival, Hallowe’en Party, Christmas Grotto, Family Fundays and social events. Ian Husband has been a huge part of Scottish Deaf football for over 30 years as a Player, Coach, Fund-raiser and Administrator. Ian has dedicated much of his life over the past 30 years to Edinburgh Deaf Football Club. In recent years Ian has help the club in various roles including, team manger, fund-raiser and chairmen however he is also known to still pull on the strip when required. In addition to working with his beloved Edinburgh team he has served as both Secretary and Chairman of the Scottish Deaf Football League. Ian has helped to ensure clubs throughout Scotland have a clear and fair structure to play there football in. Recently Ian has turned his hand to the Scottish Deaf International team. Ian, who was capped for Scotland during his early playing career, has fought the corner of the Scottish representation at meetings and assemblies across Europe. If it wasn't for Ian's determination, knowhow and dedication, the Scottish Deaf Futsal team would not have made their debut at the European Deaf Championships in November 2010. Ian was lead organiser of this trip and ensured that the players got the best possible experience from the Championships. Ian is also a grassroots champion and has been working with the Scottish FA to organising National Deaf Festivals and Coach Education training. Recently Ian in partnership with the Scottish FA organised 25 Deaf coaches from across Scotland to obtain their Club Coach Certificate. This is no mean feat and took considerable organisation to overcome many of the communication barriers that were present. In the end he found, in some case, chapping on doors and dragging coaches out their beds on a Sunday morning was the best way to get people on the course. He did this knowing once on the course not only would the coaches enjoy the experience but the knowledge they would have gained would help to engage Scottish Deaf community in the beautiful game. Ian is, and will continue to be for many more years, a driving force behind those who have hearing impairments or who are Deaf to play and enjoy the game of football. 18 months ago, Glenrothes Strollers were a disparate group of teams who shared the club name but all ran fairly independently, and as such all struggled to get by. All of the teams trained and played their games at a wide range of council and school facilities around the town and communication was at a minimal. In January 2009 with support and discussions with the Scottish FA East Region and Fife Council all teams signed up to a shared vision for the future and agreed on a 5 year development plan and in August 2009 the whole club (all 15 teams) moved to Over Stenton Park after negotiating a 25 year lease with Fife Council. The club have now developed the open parkland into a brand new football facility, laid out 9 football pitches across the 16 acre site and built their own car park. In addition they installed a group of 8 changing rooms in refurbished portacabins, built new paths and erected perimeter fencing. All of this work has been completed by their own volunteers. The club staff now maintains this park and has raised the money to buy suitable grass cutting, water removal and pitch lining machinery. At the start of 2010 the club undertook a organizational review with the end result of a more structured and organized club. The club has since implemented a written Player Protection Policy, an agreed grievance procedure and a written health and safety policy. In 2010 the club also applied for and achieved charitable status, no SC041284, the finances are audited by a CA at the end of the season and they now work to an agreed budget for the year ahead. All coaches are ‘disclosed’, qualified to coach at the appropriate level and can administer first aid where required. Over the past year they have continued to improve their club structure by adding an adult amateur team, this gives our older youths an opportunity to stay with the club when they finish at U19’s and are also fostering good links to junior and senior football. The U19’s now train on a weekly basis along with the players from the local junior club. The past year has also seen the start up of a successful and growing girls section through the Scottish FA/McDonalds programme. They have been fostering direct links with all of our local primary schools, where they now deliver fun football sessions at these schools supported by the Scottish FA & Fife Council Active Schools Coordinators (several of these schools are in SIMD areas). The club also supply their old football strips to local schools that do not have the budget to buy new kit. To help develop the quality of coaching delivered by the volunteer coaches, the club invested in a weekend (2 day) session with BJ Heinmans Dutch Football Academy. All coaches attended and learned much to add to their SFA qualifications. The past year has also seen their committee expand as they look to delegate the growing workload. In addition to the Chairman, Secretary, Treasurer and Player Protection Officer, they have successfully recruited a Vice Chairman, a Vice Secretary, a Coaching Coordinator a Young Strollers Representative and a Girls Co-ordinator. The playing membership has also rapidly increased in the past year from 280 boys (kids and youths) to 370 boys and girls across the age groups plus 20 young men in our adult amateur team. Many of these were from last season’s U19s team. The positive steps that are being made by the club are being recognized by the local community and is being reflected in the increase in membership. The club is very proactive with regards to their relationship with the local media. Their ‘Media Officer’ ensures the media are informed on reports on every positive story they have. This has heightened the local community’s awareness of who they are and what we are trying to achieve. In addition, at the end of 2009 the club achieved our Scottish FA Quality Mark ‘Standard’ status and we have topped off a fantastic year by achieving Scottish FA Community status, been voted as ‘Club of the Year’ 2010 by the Scottish FA East Region Committee and awarded runners up of the national Sunday Mail Awards as Club of the Year. Davy is responsible for the day to day running of the senior Oban Saints Teams. He is also a member of the Football Development Committee in Oban. He is also always available if any of the coaches from the Junior Teams ever need advice. He is always there to watch whichever of the 10 teams that Oban Saints run are playing. If it wasn’t for Davy doing all of the good work he does, football in Oban won’t be as well organized and enjoyed by so many adults and children. Thousands of North youngsters have benefitted immensely throughout John’s 40 year contribution to North Sport where he has continuously organised and attended fund raising events, training sessions, match events, festivals, tournaments, leagues, overseas tours. John has sacrificed much in his own personal life to the benefit and enhancement of others. He is a truly great character who thoroughly deserves the recognition that this award gives him, as without doubt, each and every one of his current and past players know that he is the best in the business. John has been instrumental in setting up and running football development in the Inverness Area for the past 40 years, has seen many of the kids he coached go on to play in the senior leagues, including Grant Munro currently at Inverness Caley Thistle and Kevin McDonald who played for Liverpool and Rangers. > I was fortunate to have a chat with John during the evening. His passion for the game continues to shine through after what has been a long and admirable career. After the hardwork he has done, more often than not without reward or proper recognition, you might think he’d relish his moment of glory. Not at all. A reluctant and modest winner. But surely a most worthy one as well.